It’s been a long time since the last issue of Chadhiyana. Nine months by my count. That’s a terribly long time for a comic I was hoping to put out bi-monthly (that is, once every two months, not twice a month as the ambiguous term can be read). 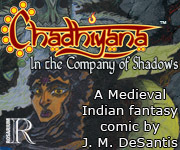 But Chadhiyana #5 is finally available to purchase on comiXology (comixology.com/Chadhiyana-5/digital-comic/464862) and Amazon (amazon.com/Chadhiyana-Company-Shadows-J-M-DeSantis-ebook/dp/B01N9OLX7D/), and it is the opinion of both myself and my publisher that this is the best issue in the series so far. Without giving any spoilers, the issue has action, new lore about the land in which Chadhiyana and the Tal-Ifatiir travel, and a twist or two. It earned a 7/10 with a favourable review on Sequential Tart (sequentialtart.com/reports.php?ID=10187&issue=2016-12-19) and 10 out of 10 readers on NetGalley gave the book a thumbs up. It is by far my favourite issue, and I think it well captures my vision for the Tal-Ifatiir and what this series is supposed to be about. For those interested in this sort of thing, Chadhiyana #5 has been a turning point for me–a break through, if you will. A lot of edits went into the original script and after completing the one-page “story”, Chadhiyana: Vampyre Hunter (which you can read on chadhiyana.com–chadhiyana.com/webcomics/chadhiyana-vampyre-hunter/), I discovered a faster way of working which didn’t sacrifice the quality of the art–I daresay it improved it! Plus, I slightly re-designed the uniform of the Tal-Ifatiir to better reflect the dark, wandering and violent nature of the group (though only the most careful readers may pick up on this). More, the experience of working on issue 5 has inspired me to make edits to the first four issues for the collected volume 1 (now pushed back to August of this year). I believe these edits will greatly improve the book, and bring it closer to my original vision which you can see here in this most recent issue. Though the precise nature of those edits I’ll have to remain silent on for at least a little while longer. As for the delay in publication for this issue, to my fans, I do apologise. In truth, Chadhiyana #5 would have been delayed a couple of months anyway. My own involvement in last year’s Rosarium Publishing IndieGoGo campaign took time away from the book for about a month or so. As to the longer delay, I can only say that Rosarium is still a small operation. 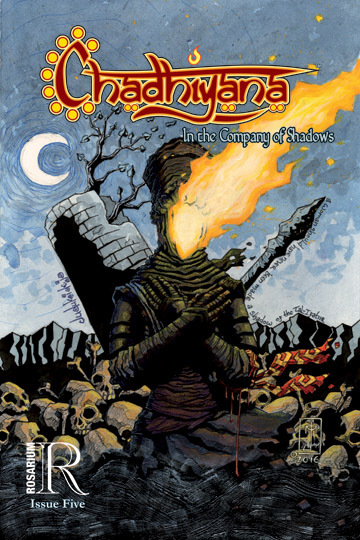 After the success of the IndieGoGo campaign (as I understand it) much work was put into trying to get all of their books a wider distribution (including Chadhiyana). Much focus was taken away from editing and publication to ensure a brighter future for all Rosarium titles. 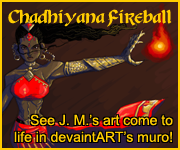 Going forward, however, I can’t promise there won’t be further delays, but I’m hoping there won’t be and that there will be more people reading Chadhiyana. So, for those of you who have been patiently waiting for this issue, you have the usual options of Kindle or comiXology’s comic-friendly interface. Only one issue remains in the first half of this story and the first Chadhiyana collection. Enjoy!